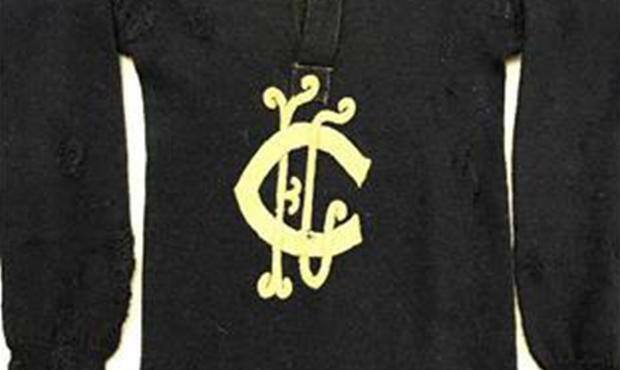 An extremely rare 100-year-old Carlton guernsey worn by the VFL’s leading goalkicker of 1918 Ern Cowley is to go under the hammer at an auction house in Melbourne. The dark navy guernsey, upon which the scrolled letters of the famous white monogram are sewn, is thought to be the oldest of its type still in existence since the white crest was adopted. That was recorded on March 15, 1909 when the Carlton committee, having met at the League Rooms on Collins Street, resolved unanimously “that a large white C. be worked on front of sweaters”. Born in East Brunswick, Ernest Clyde Cowley was recruited to the club from neighbouring VFA outfit Brunswick and represented Carlton in 24 senior matches through two seasons - from the opening round of 1918 against Collingwood at Victoria Park through to the 14th round match of ’19 against Melbourne on the MCG. Wearing the guernsey No.17 (the auction item is not numbered), Cowley plied his craft under the watch of Norman ‘Hackenschmidt’ Clark – earning the plaudits as the competition’s leading goalkicker with 35 for the season to edge out South Melbourne’s Gerald Ryan with 32 and Fitzroy’s gloriously named Jimmy Freake with 29. Though Cowley’s Carlton career was all too brief, he made an indelible mark on the game – or at least a hybrid – through the course of the Second World War. In 1943, Cowley, then employed for The Sporting Globe newspaper, devised a game known as Austus for the thousands of American troops stationed in Melbourne at the time. The game, which married the American style of throw passing with the Australian skill of kicking could be combined and was immediately adopted. The result was that matches were staged until war’s end and Cowley was awarded an international sports medal in recognition. A reserve of $7500 has been placed on Ern Cowley’s guernsey, which has been in the Cowley family’s keep and is to be sold by Abacus Auctions on November 25. While Cowley is photographed in the 1918 team photograph wearing what appears to be a polo neck top, others in the frame including Paddy O’Brien, Andy McDonald and Phil McCumisky are pictured wearing the version with button-up collar. The club would welcome any assistance from a friend or friends of Carlton in acquiring this precious guernsey for the collection. Interested parties are urged to contact Tony.DeBolfo@carltonfc.com.au.